The clownfish is quite small with orange and white coloring. 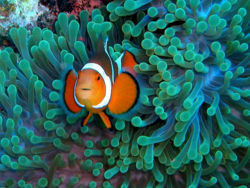 One of the reasons why the clownfish is called so is because it is very active and likes to "clown around". They are perhaps best known for spending most of its time within the tentacles of an anemone where it is protected. Many people make mistakes by keeping these fish in tanks with the wrong kind of anemone. This shortens their life span from 6-10 years to 3-5 years. The clownfish's greatest threat is humans. The clownfish, also known as the Anemonefish, is usually orange and very bright. It has three thick white stripes vertically across its body. Theses stripes are outlined with a very thin black lining, although, some clownfish can range from blue to yellow. Clownfish can grow to be as big as 2-5 inches long. Usually the females are quite bigger than males. Clownfish breed year round in tropical waters. They reproduce through external fertilization. The males attract the females by chasing, biting, and extending his fins. This behavior is called courting. The male will first chase the female to the nest. The female then lays her batch of eggs on clear coral, a rock, or next to an anemone where the male has built a nest to provide protection. The male will then guard the eggs until they hatch within 4-5 days.The eggs are released at a natural rhythm which is connected to the phases of the moon. The clownfish lives on the bottom of the sea in the Pacific Ocean, the Red Sea, the Indian Ocean, and Australia's Great Barrier Reef. They can live in shallow lagoons or sheltered reefs.But they can also live in soft corals, or large polyp stoney corals. They usually live in in a anemone with a pair. The Clownfish eats dead anemone tentacles, plankton, copepods, algae, isopods and zooplankton.Clownfish are hermaphrodites; they first are males, and then mature into females. The largest and most aggressive females are found at the top of the hierarchy of dominance.The clownfish actually has very poor swimming skills. This page was last modified on 20 June 2010, at 21:04.